Another year is almost over, and it is time to look back at last year and some of the creations I made. 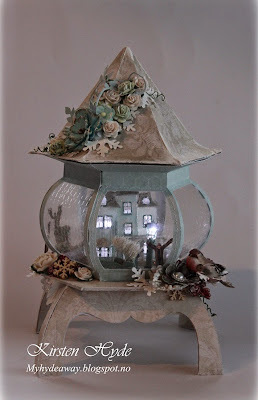 Prima light house in a bell jar. The basic light house is a file designed by Gunn-Eirill. 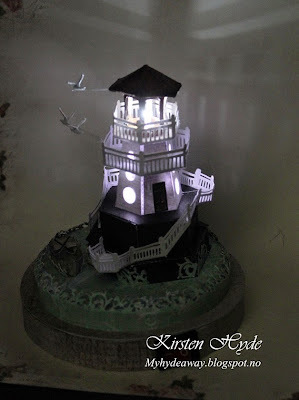 I have made the lighthouse in a tiny version, added fences, rock, boat and birds (modified with permission). 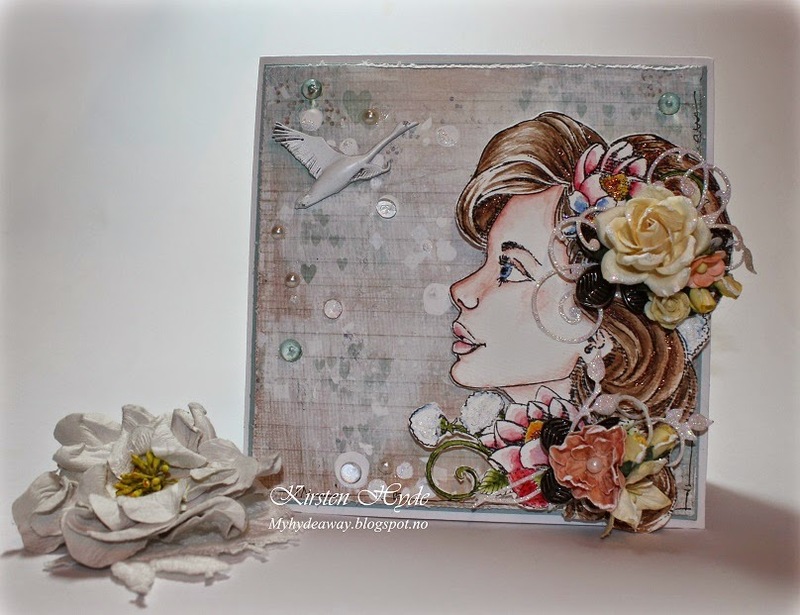 Canvas - come away with me - with Graphic 45 papers. This was made as a DT contribution for Hobbykunst. Box of cards with Graphic 45 papers. This was made as a DT contribution for StampARTic. 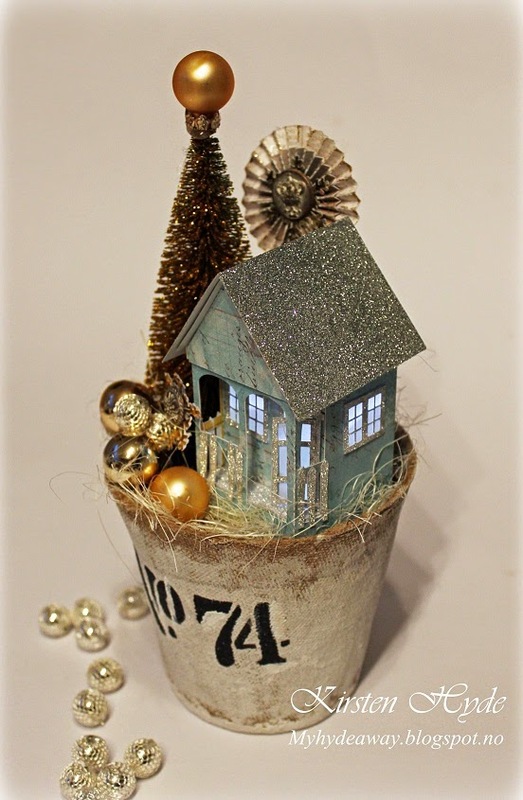 Winter Glitter house lamp with Melissa Frances papers. The lamp is my own design. The basic template and tutorial was published in Ett trykk in October 2013. 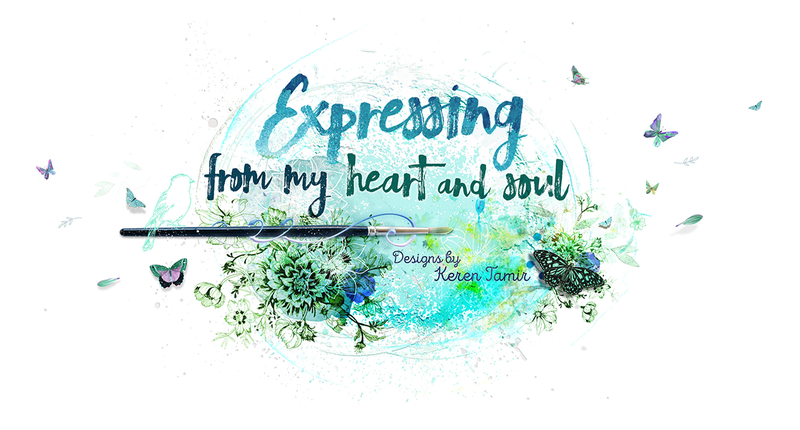 You can also find link to the template and tutorial in the blog post. This was made as a DT contribution for StampARTic, with Pion sponoring the Design Team. 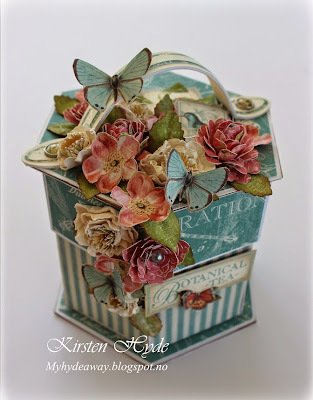 Tutorial for the folding cards and box - is from StampARTic. You can find links in the blog post. Redesign of the vintage car (from my old template to a silhouette file). 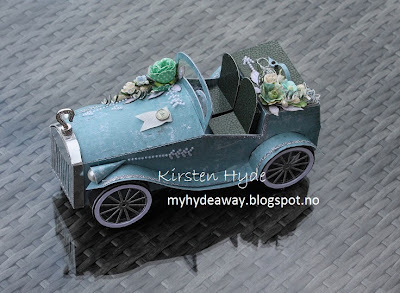 Some time ago, I designed a vintage car. The template was published in my blog. This was made a few weeks before I got my Silhouette, and I had a lot of questions about creating a silhouette file for the car. You can find link to the first template in my blog post. Contact me if you would like the studio file (for a Portrait or Cameo). Canvas made just for fun. This canvas is now on display at Hobbykunst. 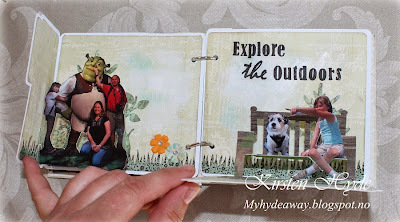 Pop-up minialbum with Prima papers. This album, was made for a class I had in Kjøpsvik (Northern Norway) last summer. 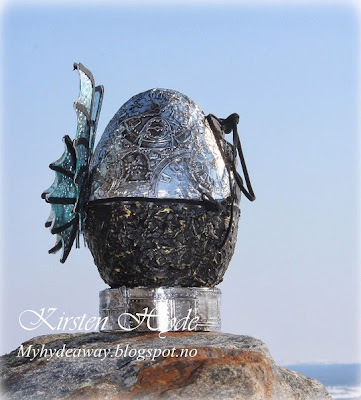 This was made for a friend and filled with craft goodies. Prima's 12 days of Christmas. 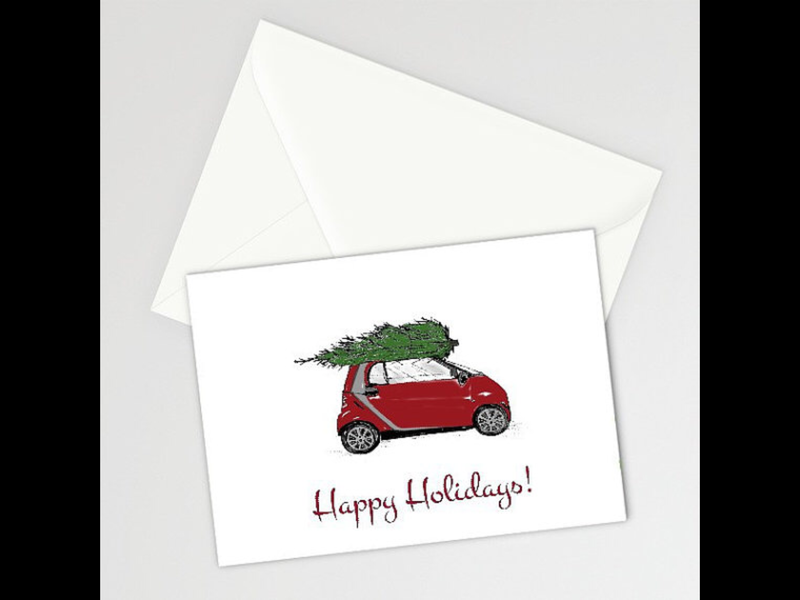 I managed to enter for all 12 challenges of the Christmas cards. This card was entered for day 9. This card won day 9. Thank you to all of you who give me so much inspiration. A special thanks to Gunn-Eirill for all the support and hours of paper fun. 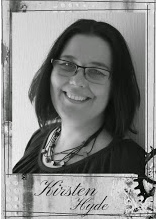 This month, I am a guestdesigner over at Scrappaloss, a Scandinavian blog. 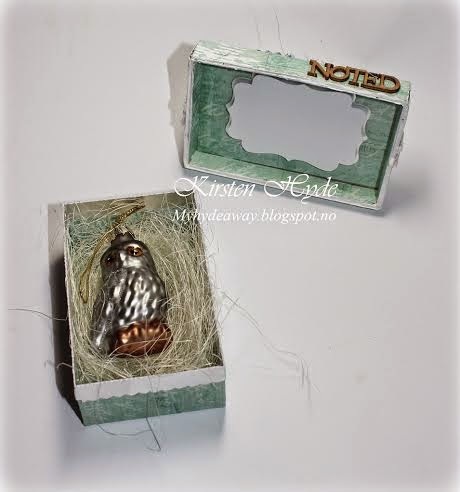 The theme this month is blue winter, and I have created a winter box with a little owl decoration inside. The box was sent as a "Christmas card" for a friend. 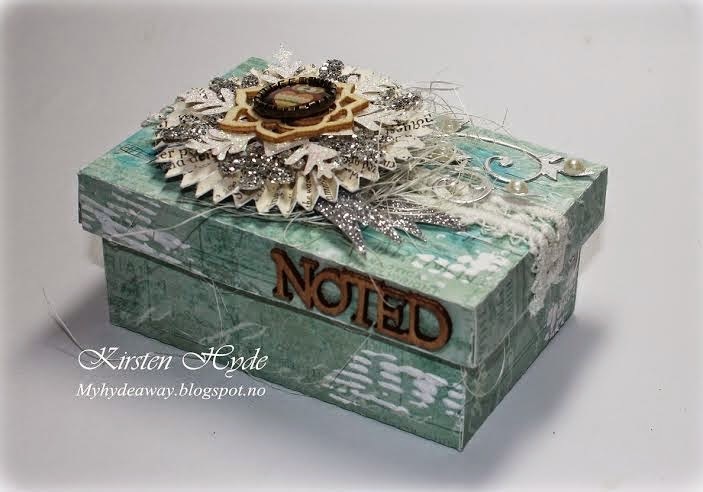 The box has been made from Prima papers: - Seashore collection - Seahorse. 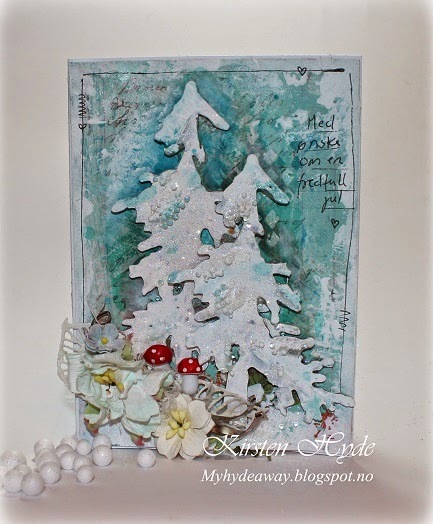 I have used distress paint, silver and black pens, stencils and gesso to create patters in the paper. I have also used silver glitter to create the glittery snowflake. I have used some old lace under the snowflakes, and silver-glitter ribbon. The wood icons are from Prima. The owl is an old brad, mounted inside a frame.The swirls are die cuts, made with dies and silver paper. I have made room for a small owl inside the box, and made room for a small personal note inside the lid. Prima launched the 12 days of Christmas challenge in November. I had a goal to try to create all the cards for the challenge. The tasks were easy to start with, but became more of a struggle when the papers, stamps and embellishments were hard to get hold of. I was really happy to win with one of the cards - Day 8. 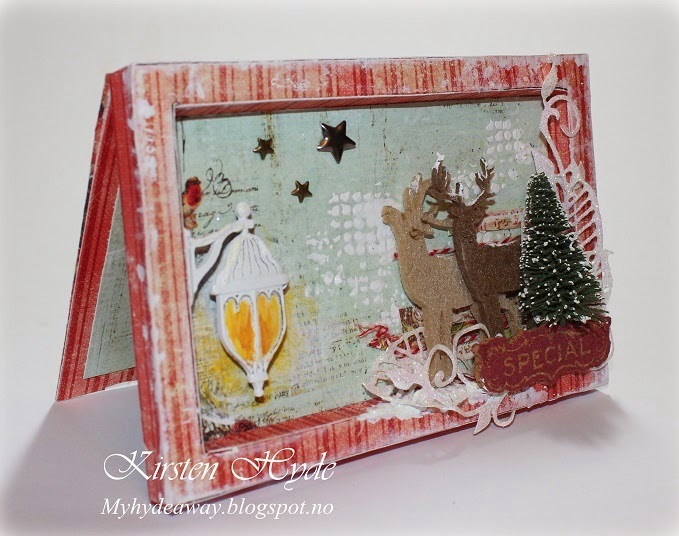 I also delivered a Christmas - Prima based tag for the 2. day of Christmas challenge. This one was also a part of StampARTic's 24 tags of Christmas. Day 4 - Finnabair's Crackle Texture Paste. 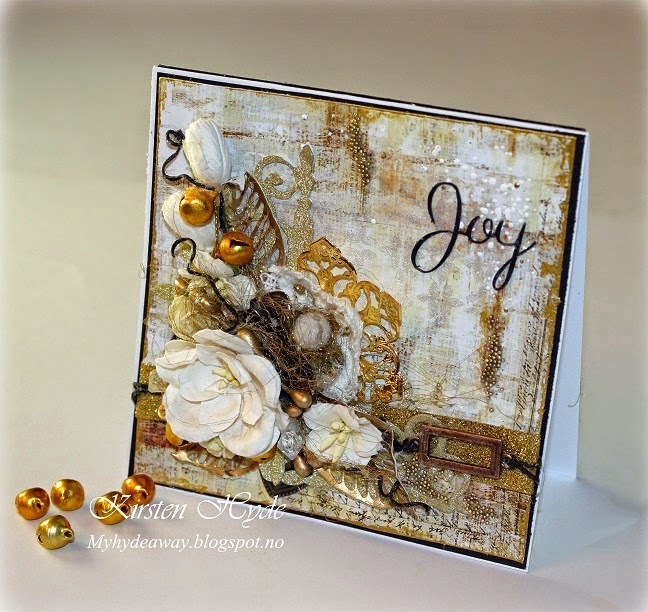 Day 8 Bloom Collection - Winner card! (created without the wooden doll - the dolls arrived 3 weeks after ordering them). My daughter really liked this card. She had to make one card this year as a Secret Santa School project. She decided to lift this card - and I was thrilled to be allowed to show the card she created. 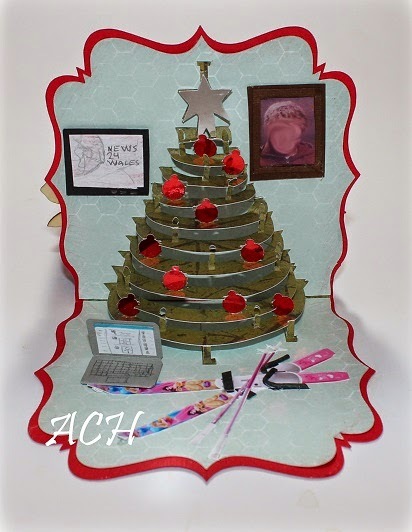 She got help with cutting the card, tree and Christmas tree decorations, and a few hints about how to get the tree to work as a pop-up tree. Day 12 - Cigar Box Secrets Collection. 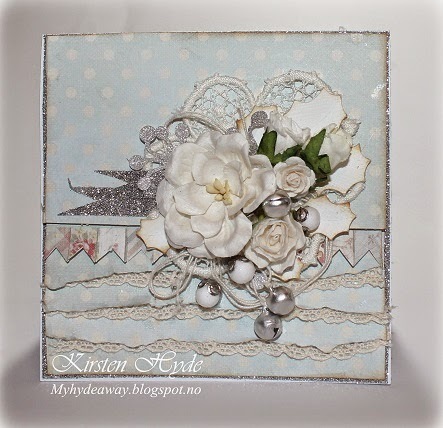 I have been asked to be a Guest Designer for Crafty boots challenges. The theme for the challenge this month is Christmas. I have seen photos of decorated Peat Pots before, and wanted to have a go. It is not the season for Peat Pots in the garden centers in Norway, at the moment. However - I did have one from last season. I started to paint the Peat Pot with white acrylic paint. 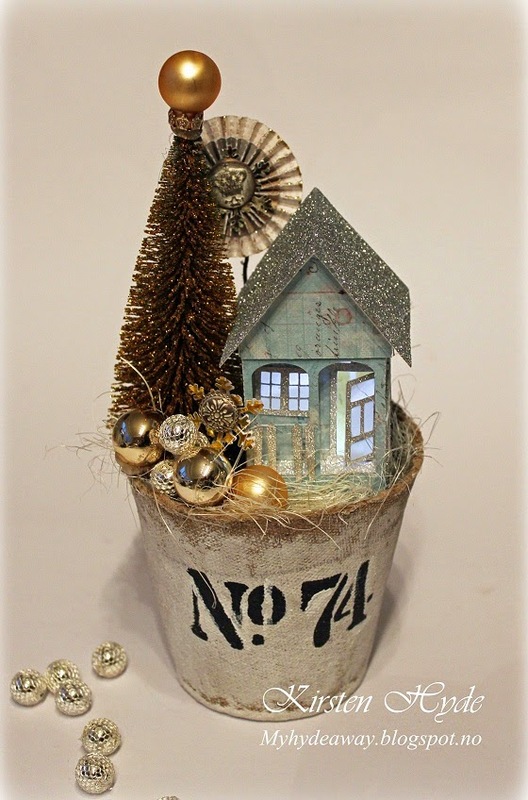 Then I made a stencil and added the "No 74" with black acrylic paint. 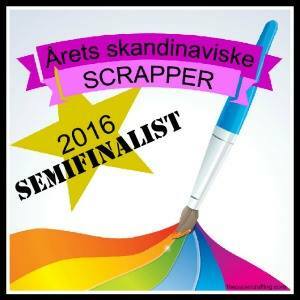 The glitter tree is from Søstrene Grene. 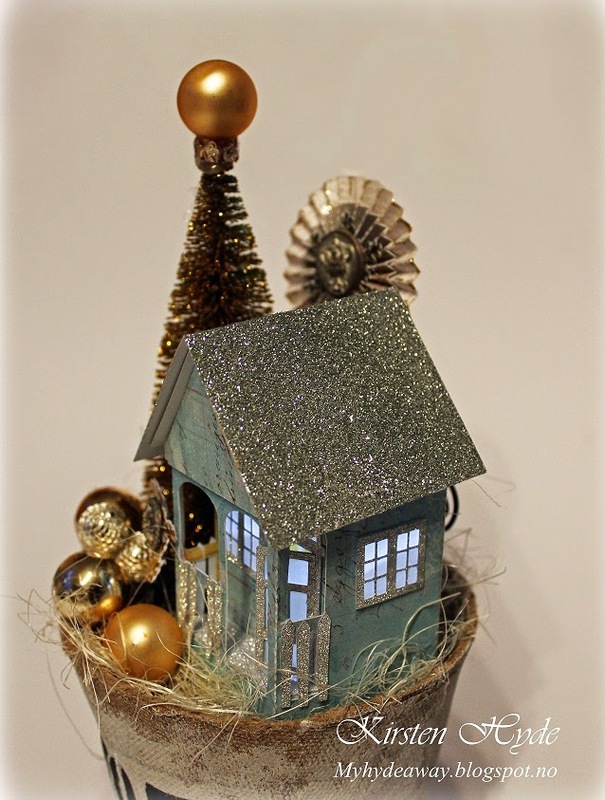 The glitter house is my own design. The template for this house can be found here. I have mounted a small led light inside the house. The roof can be taken of - and it hides the battery and the switch to turn the light on/of. StampARTic is showing 24 tags of Christmas. 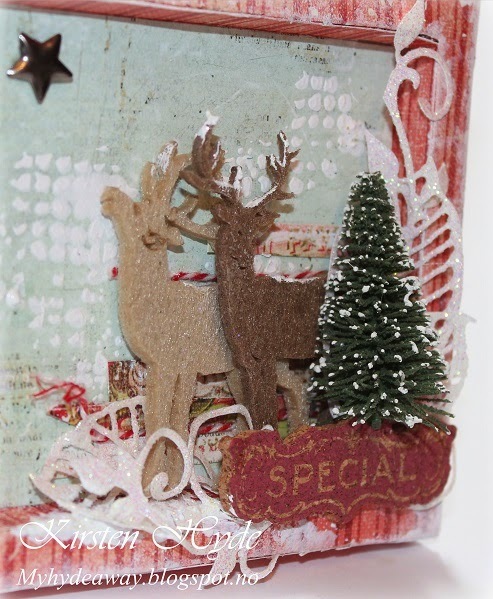 I have created a Prima based Christmas tag. 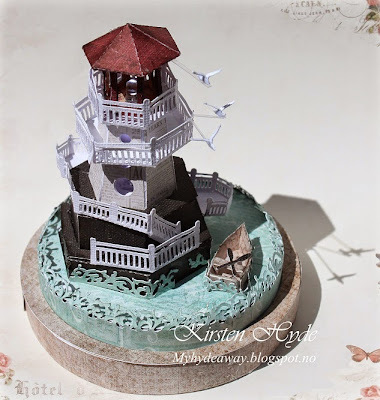 I have used papers from - The Seashore collection - Seahorse from Prima. 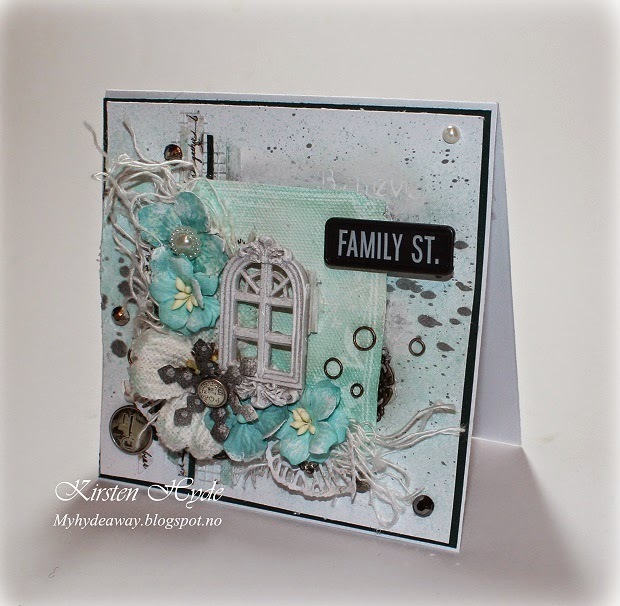 I have used a stencil, Gesso and Colour Bloom spray (Soft Teal)to create effects on the background. 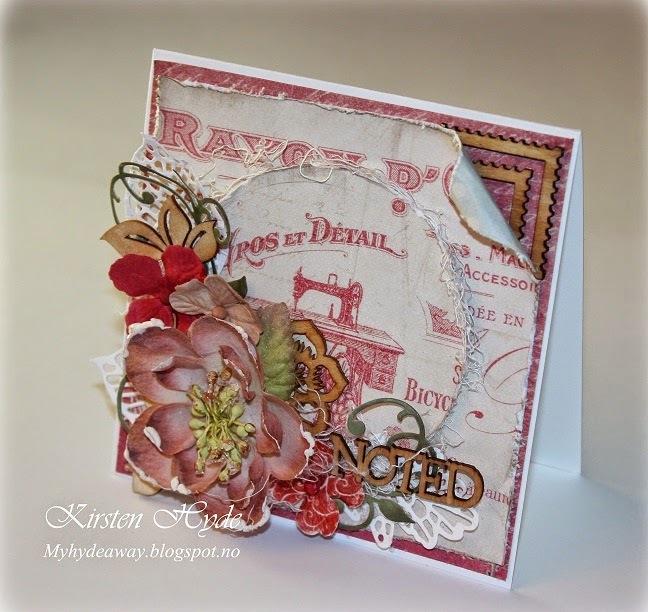 The leaves are diecuts - made with dies from Prima. 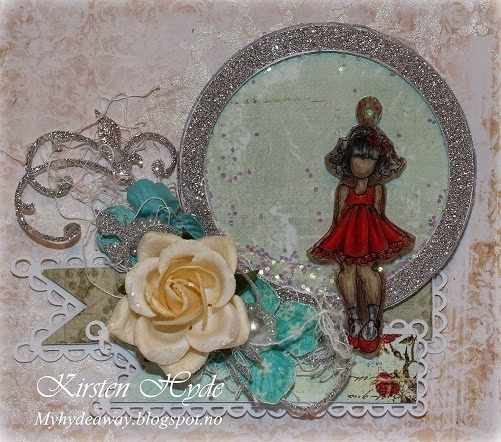 The Crincle ribbon is from Tim Holtz. It is embossed with white and silver "Snowflake" embossing powder. 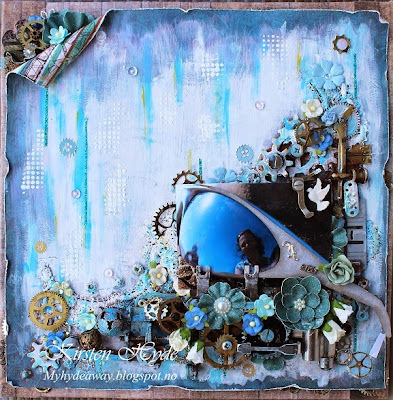 Hiding in my craftroom - Super Scrap Saturday. 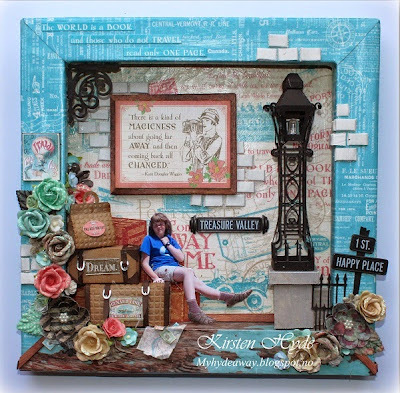 The final challenge was to use the Cigar Box Secrets Collection. I managed to get hold of a few papers and cork stickers. I wanted to create a different card this time. 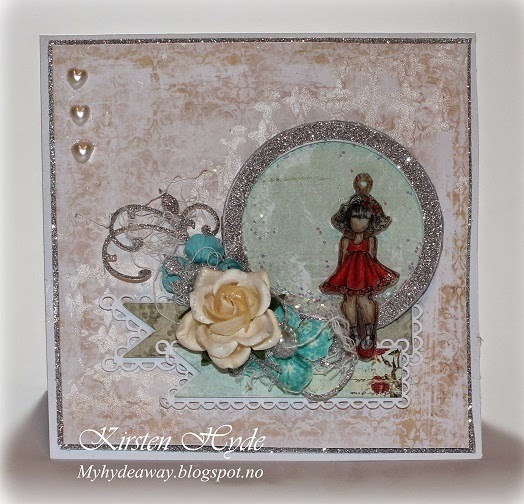 This time, I created a "Shadow box" card. I have used the papers Robusto, Perfecto and Figurados from Cigar Box Secrets. The deers are from Rayher and the lamp is from Prima. 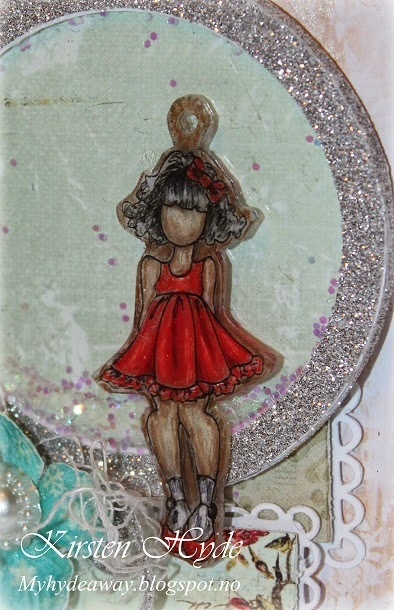 I have also used gesso with glitter from Prima, sprinkled in the Gesso. The stars are from Finnabair. 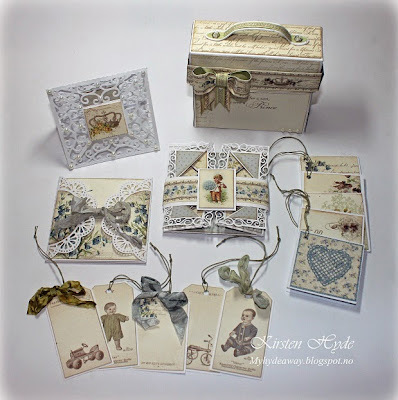 The challenge for the 11th day of Christmas was the Julie Nutting holiday stamp sets. These are really sweet. I was only able to get hold of Warm Wishes - so this was the stamp I used. The front and back of the cards has paper from The Stationers desk. The leaves are wood icons with Gesso and glitter. 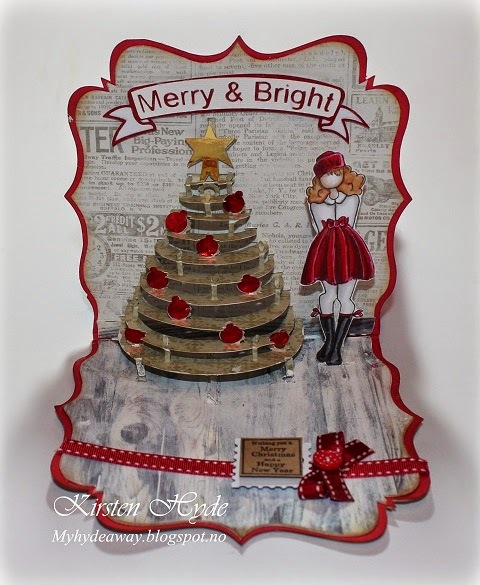 A few weeks ago, I set myself a challenge to make all the Christmas cards for Prima's 12 days of Christmas. The challenge has really been a huge challenge. Not in creating the cards, but to get hold of the items needed to create them. So a week ago, I got the box of Prima Wooden Dolls ordered. My little problem, is that they have NOT arrived! The computer system in the post office, seems to have no information about the package! There is no more time to get the package through the post, before the end of the deadline. So turning panic into something constructive - I was determined to enter with all the cards. So I had to rethink. I looked through the dolls online. I found that I had got one of the stamps. The stamps are large compared to the wood dolls. So my solution was to stamp onto shrink plastic.Then I coloured the stamp with Prismacolor pencils and shrunk the plastic by adding heat. The card I created, was a simple card this time. There is a shaker box behind the girl, with "snow" glitter inside. 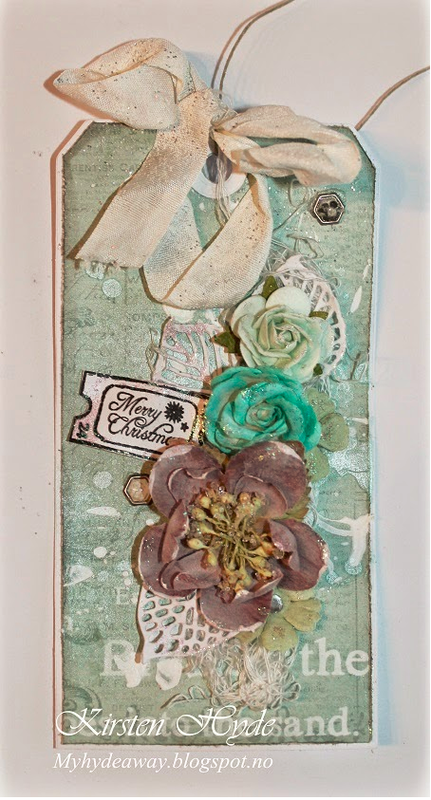 The papers are from The Cigar Box Secrets Collection and Epiphany collection from Prima, The blue flowers are from the November kit. 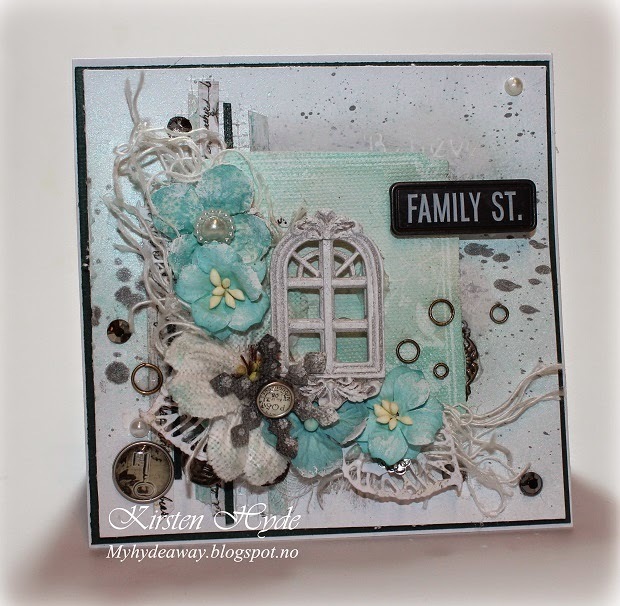 I have also used stencils Gesso and Finnabair's Crackle Texture Paste to create some background effects on the paper. The Challenge for day 9, was Color Bloom sprays. 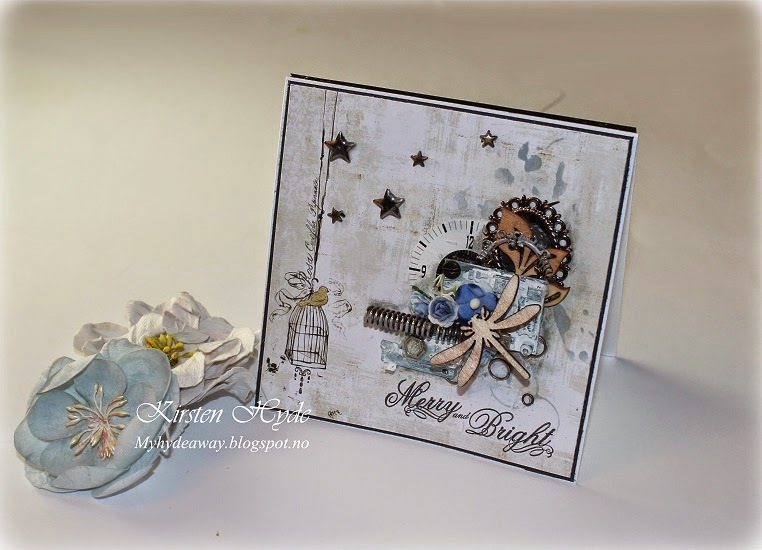 These Christmas cards has been a challenge to me, to get out there, and try more of the Prima products, that I do not normally use. I must admit, I have tried these sprays before this challenge, but they are quite new to me (even though I got hold of them the day they came for sale at Hobbykunst). It has taken me some attempts to learn how to use them. Getting the mist out of them is fine, but it was a challenge to learn how to get the spray to splatter. I guess reading the bottle helps: "Shake WELL before use". So this is my go at the Bloom sprays. The background paper is plain Bazzill, decorated with stripes of different Prima papers and the mist (and, yes - the spray will splatter). 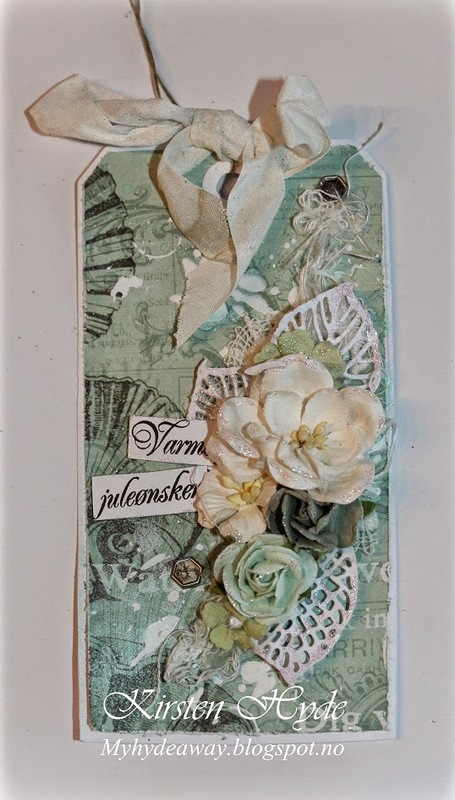 I have also used the mist on Prima's Resist Canvas - North Country shapes - and this works brilliant too. The window is a resin shape from Prima and the Streets sign is also from Prima. StampARTic's Design Team had a tradition of showing youis showing you 24 tags of Christmas in December. It is the 5.th of December, and today it is my turn to shown a tag. 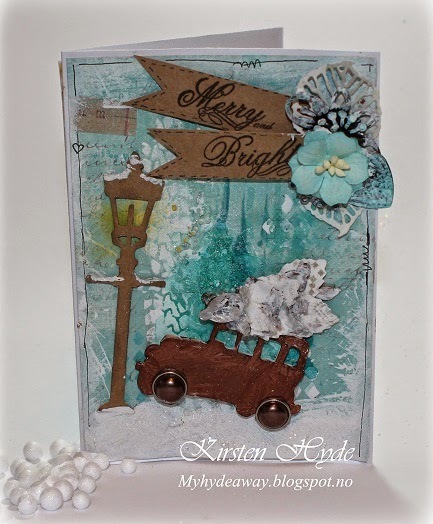 I have created a tag with Prima - Seashore collection - Seahorse. I have used a stencil and Gesso to create effects on the background. I have also used Colour Bloom spray (Soft Teal). 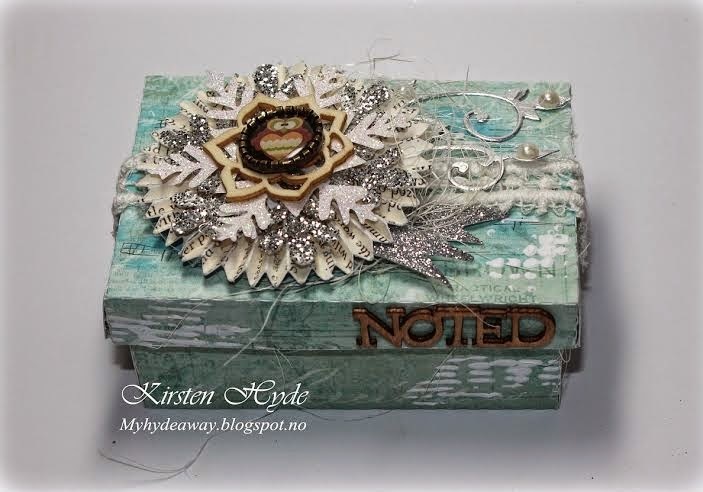 The leaves are diecuts - made with dies from Prima. 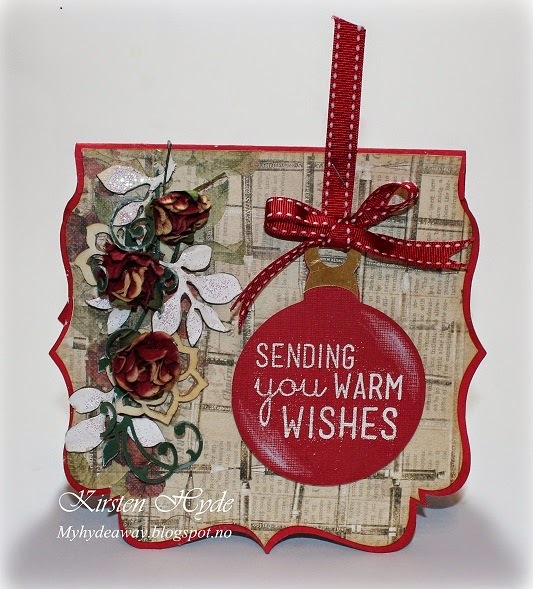 Day 8 of the Prima Christmas cards, was the "Bloom collection" stamps. I managed to get hold of the Sophie bloom stamp, and decided to do something different than the other cards I have delivered for the challenge so far. I decided to colour the stamp. I colour with watercolours, Prismacolours and Promarkers, but this time - I decided to go with the Promarkers. 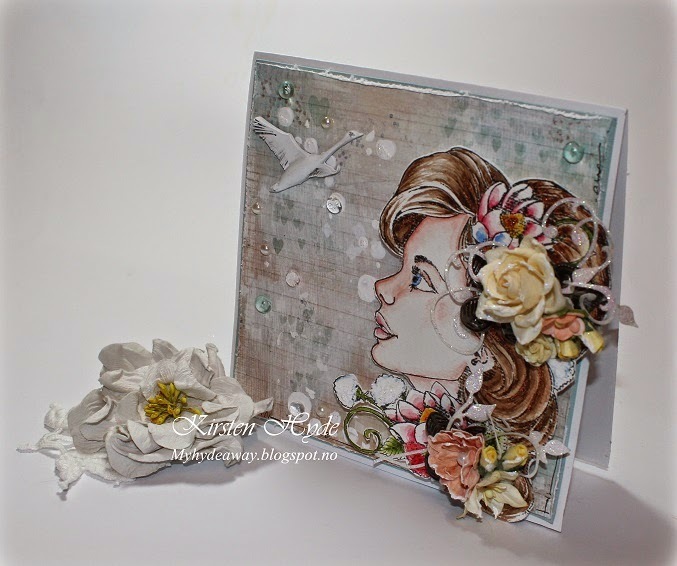 The bird, is from one of Primas collections, and the paper is from the Princess collection. 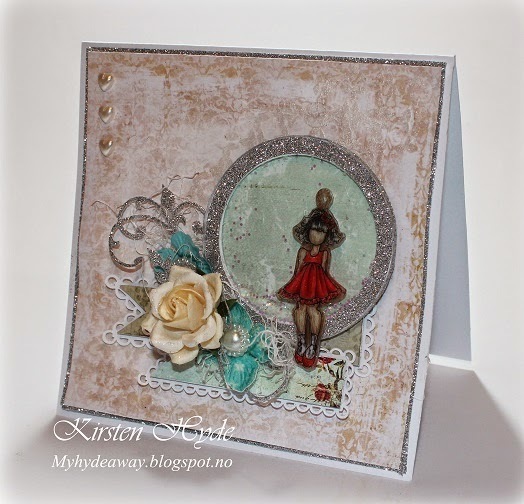 I have used stencils and Gesso to create effects on the background. I have also used glass and plastic beads.